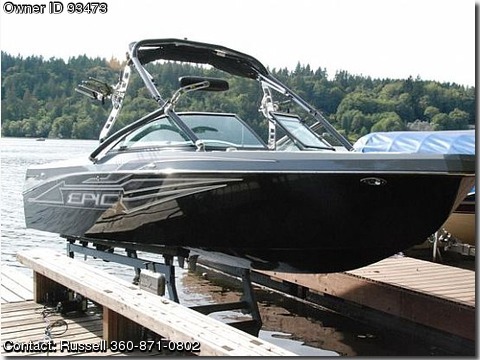 Call Boat Owner Russell 360-871-0802. Am/fm stereo, bimini top, bilge pump, depthfinder, gps, swim platform, trim tabs, 2 axle trailer, 2 batteries, winter cover, original owner, prof maintained, stored indoors, This is a demo wakeboard surf boat with just over 60 hours. The oil has been changed twice and the transmission fluid changed once. All the break in is done. This boat is loaded with smart tow gps speed control. Has a massive stereo PA system with two amplifiers, 6 speakers inside, a sub woofer and eight speakers in the transom. Comes with a bimini top, heater, blue LED courtesy lights all over the boat, a towing cover and a storage cover. The trailer is a dual axle with disc surge brakes on all four wheels. It also has a swing away tongue and alloy wheels. Standard features of an epic V23 include 3 built in ballast tanks capable of holding a total of 4000 pounds. You will never need a fat sac so all the storage can be used. Dual rudders allow ease of steering the boat when totally weighed down. Has rubberfoam flooring-no carpet to collect dirt and hold water. Easy fold down tower that can be put up and down by one person in a minute. Seating for 14 with the ballast.